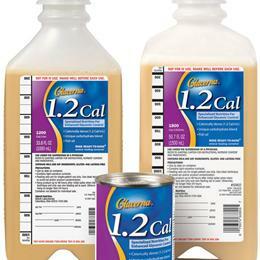 Glucerna 1.2 Cal: Glucerna 1.2 Cal Is A Calorically Dense Formula With A Unique Carbohydrate Blend For Enhanced Glycemic Control And Fish Oil To Support Cardiovascular Health. For Patients With Type 1 Or Type 2 Diabetes; For Patients With Hyperglycemia/Impaired Glucose Tolerance Resulting From Metabolic Stress, Such As Illness, Trauma, Or Infection; For Tube Or Oral Feeding; For Supplemental Or Sole-Source Nutrition; For Use Under Medical Supervision; Not For Parenteral Use. Features:-Glucerna 1.2 Cal Has Been Clinically Shown To Significantly Reduce Peak Postprandial Blood Glucose Response By 49 Mg/Dl (69%) And Reduce Glycemic Variability Versus A Standard 1.2 Cal Formulation In People With Diabetes; At 1.2 Cal/Ml, Patient Needs Can Be Met With Less Volume-20% Of Calories From Protein To Promote Anabolism And Support Wound Healing; Macronutrient Distibution: 45% Fat, 20% Protein, And 35% Carbohydrate-Includes 10 G/L Of Nutraflora® Scfos® (2.4 G/8 Fl Oz And 15 G/1.5L); 4% Of Total Calories From Saturated Fatty Acids And Rich In Monounsaturated Fatty Acids (28% Of Total Calories), Meeting American Heart Association And American Diabetes Association Guidelines; Provides Plant-Based Omega-3 Fatty Acids From Canola Oil (3 G Of Ala Per 1500 Calories) And The Omega-3 Fatty Acids Epa And Dha (1 G Per 1500 Cal) From Fish Oil, Which Meets American Heart Association Recommendations To Support Circulatory And Heart Health; Chromium, From Chromium Picolinate, The Most Bioavailable Form Of Chromium, Clinically Shown To Lower Fasting And Postprandial Glucose Levels And A1C.6 Chromium Picolinate Supports Glucose Tolerance By Helping The Body'S Own Insulin Work Better; 1500 Cal Provide At Least 100% Of The Rdis For 24 Key Vitamins And Minerals; Supplemented With Conditionally Essential Nutrients Carnitine And Taurine Vanilla, 8 Fl-Oz Cans; 24/Case .